Welcome to Treliske Organic, home to some of the world's purest "certified organic" wool, knitwear, babywear, beef and lamb. This beautiful soft,reversible blanket is knitted from the wool of our Coloured Merino Flock in a rich dark brown and silver plaid pattern and measures 105cms x 100cms. 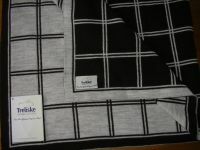 Perfect to use from newborns to toddlers as the blanket fits the basinett folded and then the cot later. The blanket is stunning and could also be used equally well as a furniture throw. Unique Limited Stock of Natural, Rich Dark Brown, 4 ply and 8 ply Merino which is Rarely Available. Spun entirely from Treliske's coloured Merino flock, this soft undyed Organic Wool is available in 50g balls in limited quantities. Be quick to avoid disappointment. Treliske's principal activity is the production of high quality certified organic wool, beef and cereal crops, within a farming system that respects both animal welfare (mulesing is not practiced) and the environment. The Treliske merino wool range includes organic babywear, baby blankets, knitwear and knitting wool yarns which are ideal for delicate skins being soft, non irritating and free from harmful chemicals.